1 in 5 of businesses with a BDR plan lack a comprehensive strategy. As part of Disaster Recovery Awareness Month at Quadric, this week’s post will cover Offsite Vaulting as part of a balanced, healthy disaster recovery plan. In the event of a flood, fire, ransomware attack, or other potential disaster, offsite vaulting is an essential part of a successful disaster recovery plan. Whatever you use for a backup solution, it should include regular backups and offsite vaulting features. Even though regular backups are important, offsite backup and recovery provides site-level protection to ensure that your business can fully recover. Sending your critical data to a remote location ensures your data is fully available and can be restored after a system failure or natural disaster. Before we get into a further explanation of offsite vaulting and data recovery, we’d like to take this opportunity to explain a few terms that tend to be confusing in this industry: Recovery Point Objective (RPO) and Recovery Time Objective (RTO). RPO answers the question of how much data can you lose if there’s a disaster. Think of it as the “threshold” of data loss within the DR Plan. How often you vault your backups is determined by your company’s RPO. If the minimum amount of data you can realistically lose is 12 hours worth, then you should vault backups every 12 hours. RTO is how much time can you spend recovering without any major consequences. In other words, it is the “threshold” of the break in business continuity. Determining the RTO and RPO together will help you create a backup and recovery plan that minimizes loss. If your RPO and RTO both have small thresholds, then you will definitely want offsite vaulting as part of your BDR plan. What Makes a Fail-Safe DR Plan? Provides efficient, affordable, site-level recovery from anywhere with only storage required. Access to cloud storage helps secure your backups and enables you to fully recover your data and your systems, even without an additional offsite infrastructure. VM replication should include the ability to replicate running VMs to secondary environments in a single, efficient operation. Source and target-side, global deduplication only transfers unique, changed data saving time and bandwidth. This also allows you to scale with your virtual environment. Want to Know More? Watch! Alike DR’s offsite data protection (offsite vaulting) can help make your disaster recovery plan more efficient and affordable. With Alike’s offsite vaulting, you have the option to send your fully encrypted data to the cloud using Amazon S3, or you can send your secured data to another offsite location with a separate infrastructure. These options will also make budgeting much easier. In addition, Alike’s unrivaled, global deduplication provides impressive compression ratios, saving storage space and money, no matter where you store your backups. Because you only need storage on the remote side with Alike, our offsite vaulting is also highly efficient. We are committed to providing enterprise-level data protection, without taking up your system’s valuable resources. With Alike’s secure, reliable, and cost-effective offsite vaulting features, you can help minimize the damage, even in the worst disaster. 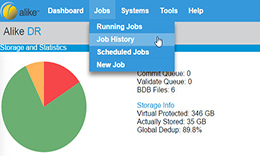 Learn how to quickly create backup jobs and protect all of your VMs on a single host. The Quadric support and development staff are top of the line, and I work a lot with different vendors.